Christmas, one of the great feasts of the Christian calendar, has been shaped and inculturated in innumerable ways through the centuries. What does it celebrate, and how does it do that? 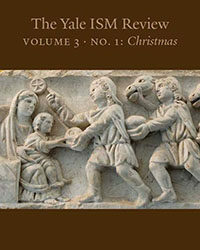 This issue of The Yale ISM Review takes up these questions and provides insights and some surprising answers—in music, art, literature, and liturgy. Thank you for visiting us today. If you like what you see, subscribe! Subscription is absolutely free and open to all.